Research to help you make smart financial decisions. 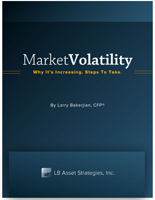 Market Volatility—Why It’s Increasing. Steps to Take. By Larry Bakerjian, CFP®, LB Asset Strategies, Inc. 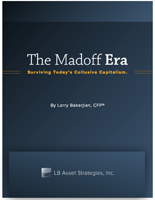 The Madoff Era—Surviving Today’s Collusive Capitalism. By Larry Bakerjian, CFP®, LB Asset Strategies, Inc.